Droidcon 2012 party at Counter Culture - it's partaay time, folks! 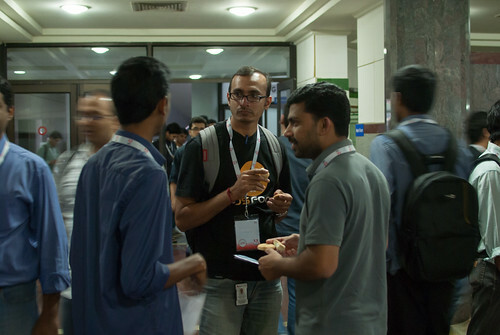 Meetups and parties are a regular feature of large conferences that we organize. These are occasions where you get to talk to speakers, fellow participants and all the conference attendees, outside the formal atmosphere of a conference set-up. The craziest and whackiest ideas emerge over a mug of beer or a toothpick of aloo tikki, a time when the mind is brimming with excitement, enthusiasm and mirth. In our experience of organizing conferences for the last two years, we have come to realize that participants let their hair down in an informal atmosphere, where everyone is having fun. We had a large gathering of about 250 participants at the Droidcon 2011 party, sponsored by GitHub. Participants chattered and chattered from 7 PM to 11 PM that evening! There at the bar me and Older Kamal have some talk with first mug of beer at the smoking area. the talk continute for more that half an hour i think. after that had the snack and i get prepared for next drink. ... ... ... later i asked Kamal M to join with me for a drink. he say yes i spare one beer token to him and i order a whiskey. from here my life is going to change. me and Kamal M moved to the smoking area and started talking. i think that talk taken more that an hour. we discussed more technologies, personal stories and more. while we met the Robo(Enthiran) Rakesh Pai he explain about about how he made erroception also the robo. he explain about firmata and more. Rakesh put a proposal with Kamal M to start a commuity called Mumbai JS. Hear this i thought that the punch line of Cafe Coffee Day is wrong its ” a lot more can happen over a Beer” not coffee. after the party we split ed up and Kamal M moved to his hotel, Older Kamal to his home also Kasyup. i hired an rickshaw back to the room. i found that i forgetten my shyness and fear while talking with Kamal (both) and made me to meet to many people. at the time while talking with Kamal M i forgot my Language problem and talked for more than an hour. now i realized that i can changing. these feeling are my negatives and i am happy for that i can wash it away. Also showed me who is a geek? So what are you waiting for! Every Droidcon India 2012 participant is invited to the event party on Friday, 2nd Nov, from 6:00 PM onwards at Counter Culture restaurant!